The purpose of this project is to create electronic maps of the Colorado 4WD Trails for Garmin GPS units (with mapping capability). Although numerous printable maps and GPS waypoints of the trails are available the addition of GPS maps allows more energy to be spent enjoying the trails and surrounding areas versus navigating. This is an on-going project with additional trails added as time allows. The trails are added in a somewhat random order so if there one you would like to be added sooner rather than later please let me know. Trails are added as they are completed - check back for updates. The installation of the maps is fairly simple. The maps can be utilized from within Garmin's MapSource product (if available) or simply uploaded to your GPS unit. 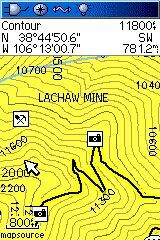 Note that the custom style (trails and POI) are only available in the MapSource version. For use from with Garmin's MapSource, download and execute the installation package. A README file with more detailed usage information will be displayed upon completion of the installation. For standalone use, download and execute the autosend package. 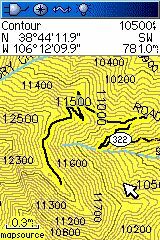 The Colorado 4WD Trails mapset should overlay any other mapset present on your GPS unit. If conflicts arise (between mapsets), simply hide/show mapsets as described here. Any feedback (comments, corrections, questions, etc.) is welcome and encouraged. I primarily make these maps for my own use and as a learning experience but it is good to hear when others find them useful. Please direct all feedback to the email address shown at the top of this page. An excellent resource covering Colorado trails, includes trail descriptions, detailed directions, maps and photos. Another excellent resource focusing primarily on easier, less extreme, trails. Includes area history, trail descriptions, detailed directions, maps and photos. This data set contains imagery from the National Agriculture Imagery Program (NAIP). NAIP acquires digital ortho imagery during the agricultural growing seasons in the continental U.S. and provides ortho imagery within one year of acquisition. NAIP provides 1 meter ground sample distance (GSD) ortho imagery. Provides transportation and boundary data in ESRI Shapefile format as either statewide or county files. Originally created to support CDOT planning projects and have been compiled from various sources and scales. The National Elevation Dataset (NED) is a new raster product assembled by the U.S. Geological Survey. NED is designed to provide National elevation data in a seamless form with a consistent datum, elevation unit, and projection.